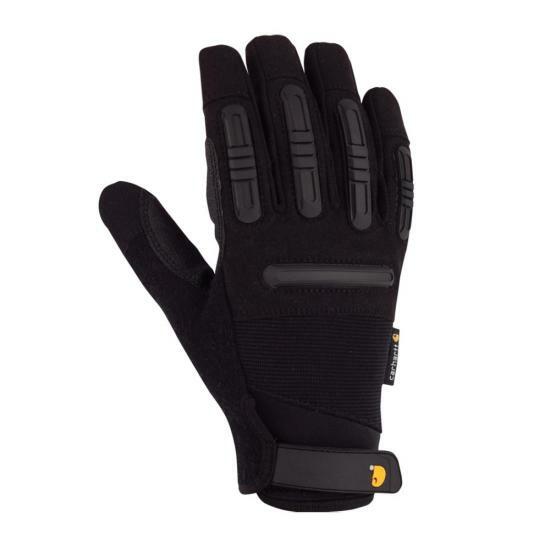 This glove is durable, reliable, and true to size. It's really warm on cold days: below 32 degrees. Overall, its a great quality glove. ... I like this product and would recommend it to my friends & family. Great work Glove. Buy a pair! After doing my research and trying on countless different brands of gloves I purchased this pair about 1 month ago. I don't normally spend more than 20 dollars on gloves as I have had bad luck with durability beyond a week. After reading the reviews about these gloves and most people stating how well they held up I shelled out the $40.00. These gloves started falling apart 3 days after purchase. I admit that I'm hard on gloves as I operate a Tow Truck. I own several other Carhartt products and have not had a single issue. These gloves leave a lot to be desired. The finger and palm grips started cracking, seperating, and falling off the glove. The seams started coming apart after a week. I don't know what the other people are doing to make these gloves last so long, but under normal everyday usage handling chains, tow hooks, and grabbing control knobs these where the worst pair of work gloves I have ever purchased. Will not be spending any more of my hard earned money on Carhartt gloves. Well worth the money! I’ve gotten more than a year out of these gloves as a truck driver. I usually would go through a pair of work gloves in 2-3 months if I was lucky. I’ll never buy another brand of work gloves. I just recently ordered a 2nd pair just to have if the first pair ever wears out! I highly recommend these! You won’t regret this purchase. I got myself a pair about 3 or 4 years ago at a Bass Pro Shop and they have been the best full fingered gloves I've ever used. I used these mostly for when I would work with my dad and cut metal so these did get shredded up pretty bad. I've also used them when I would go outdoors and I wouldn't have to worry about scrapes or thorns. The grips on the palm and fingers are all worn down and torn in some places but that is expected with what I've used them for and for such a long time. I absolutely recommend these if you want to protect your hands and don't need too much grip. To clarify, I do still use these since they still manage to protect my hands well but because they are worn they have lost a lot of grip. One thing I will warn about though, the bumpers over the knuckles and fingers will tear if you bend them too much so don't try scrunching up or stuffing these gloves.The pre-cut points on the fingers for bending have still held though. Just began wearing this glove for trucking/material handling. Seems much more durable than other dexterity gloves I've tried. Only problem I find is with the fit. I purchased my normal glove size Large. I find the fingers of this glove too long & narrow which compromise comfort & dexterity and, I find the palms have too much material yielding a very loose, unsure fit in that area. Too bad because otherwise the glove design and durability seem like a home run. I like the knuckle protection and the fact that they have sturdy pull tabs at the wrist that make for fairly easy on and off for a non-gauntlet/safety cuff glove. Carhartt makes great products but sometimes they're hard to buy online because of sizing inconsistencies across the product line. Wish they'd fix that but I'm still a great believer in their products and customer/warranty service is always well-above par. (Never really had a warranty issue, except with shrinkage which Carhartt offered to fix but it wasn't that bad so I declined.) Hoping fit of these gloves improves a bit with wear, but I'm still able to use them. Best pair of work gloves yet! Best pair of everyday work gloves I've purchased in a very long time. Very durable and complete hand protection period! Trust me. This is coming from a person that is a true jack of all trades and a REAL HIGH DEXTERITY HANDYMAN! Well worth every penny.